Background: Increasingly, more patients are obtaining medical information from the Internet with which they are confronting their physicians. Very few studies have been reported from developing countries concerning physician's attitude to such patients, and to our knowledge, none has been reported from Sub-Saharan Africa. This study looked at the attitude of Nigerian orthopaedic surgeons to such patients. Methods: This was a questionnaire-based interview of orthopaedic surgeons and their trainees at the 2013 annual conference of the Nigerian Orthopaedic Association in Lokoja, Nigeria. It was supplemented by an online Google form survey. Results: One hundred and twelve questionnaires were returned, and seven were incompletely filled and were discarded, leaving 105 for analysis. About 94.3% of the respondents have had previous encounters with e-patients. The mean attitude score was high (3.64 ± 0.46, the highest obtainable was 5.0). Consultants and orthopaedists in semi-urban settings scored higher than other categories. 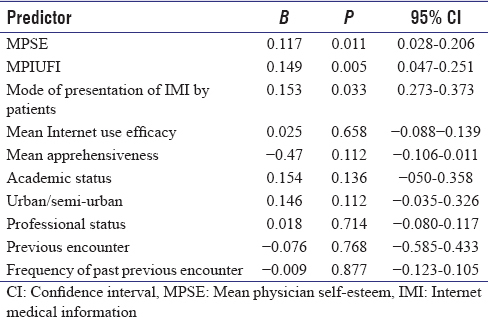 The physician's self-esteem and efficacy of using the Internet correlated highly with their attitude to e-patients. Similarly, self-esteem, the frequency of using the Internet and the experience of the way e-patients have been presenting their information (print, verbal or electronic) were the significant predictors of physicians' attitude to e-patients. Conclusion: Orthopaedic surgeons and their trainees practising in Nigeria frequently encounter patients with Internet-based medical information at consultations. Most of them have high positive attitudes towards these patients. There is a need for these doctors to become skilled in online information handling to become better at guiding such patients. Conventionally, the physician has been responsible for integrating all sources of medical information which he then conveys to the patient at the time of consultation. With the emergence of the Internet in the 80s, there has been a shift in the role of patients from a passive recipient of health information to the active participant in retrieving and relaying medical information. In the United States of America, the word e-patient has been coined to describe those who used the Internet to source for health information., Sourcing for medical information is the third most common reason for assessing the Internet. The information retrieved from the Internet has influenced subsequent decision-making in many of the patients. For example, 70% of e-patients in a study in the USA reported that web information changed their decision about how to manage their illnesses and 50% of them sort opinion from another doctor. The Internet has enhanced patients' understanding of their health conditions, it has empowered them to manage their illnesses better and it has increased their confidence in their interactions with physicians at consultations. This brings to question: how are physicians handling this revolutionary shift in the ways patients and physicians interact and how do they react when patients present them with unsolicited Internet-derived information? There are studies from developed countries that showed physicians' reaction to e-patients varies.,,, While many physicians believe that the information obtained could be beneficial to the patients, they also expressed concerns regarding the accuracy of the information. Many physicians felt that they were obliged to vet the patients' Internet-derived information, and they see this as an unwelcomed additional responsibility. In fact, some physicians felt threatened by such encounters; Murray et al. found that 10% of 1050 physicians in the USA reported a worsening of their patient–physician relationship due to their feeling 'challenged' by patients. The objectives of the present study were to assess the attitudes of orthopaedic surgeons and their trainees to their encounters with e-patients and to examine the effect of age, gender, professional self-esteem, information and communication technology (ICT) proficiency, years in practice and their certification as consultants on their attitudes. The participants of this cross-sectional study were Nigerian orthopaedic surgeons and their trainees who attended the 2013 Nigerian Orthopaedic Association (NOA) Annual General Meeting and Scientific Conference at the Federal Medical Centre Lokoja, Kogi State, Nigeria. The NOA is the umbrella body of all orthopaedic surgeons in Nigeria. It holds an annual meeting in different parts of Nigeria. Both certified orthopaedic surgeons (consultant orthopaedic surgeons) and residents in orthopaedics are expected to attend the event. Eighty-eight questionnaires were distributed at the event and 61 (69.3%) were returned. After the event, we collected the E-mail addresses of 54 of the remaining conference attendees, and using Google Forms, we sent an online questionnaire to them. Twenty-one (38.9%) persons filled and returned the form. To prevent double entry, we identified participants who filled out the questionnaire using the biodata section on the form. The attendance register was used in identifying those who did not return theirs or were not given the form to fill. Finally, we served questionnaires to orthopaedists in the nation's tertiary health facilities who did not attend the meeting or could not fill the questionnaire during the annual general meeting. Thirty forms were obtained in this manner. Overall, we collected 112 questionnaires. The instrument of the survey is a 46-item questionnaire divided into eight sections. Demographics contain the patients' personal and professional data. 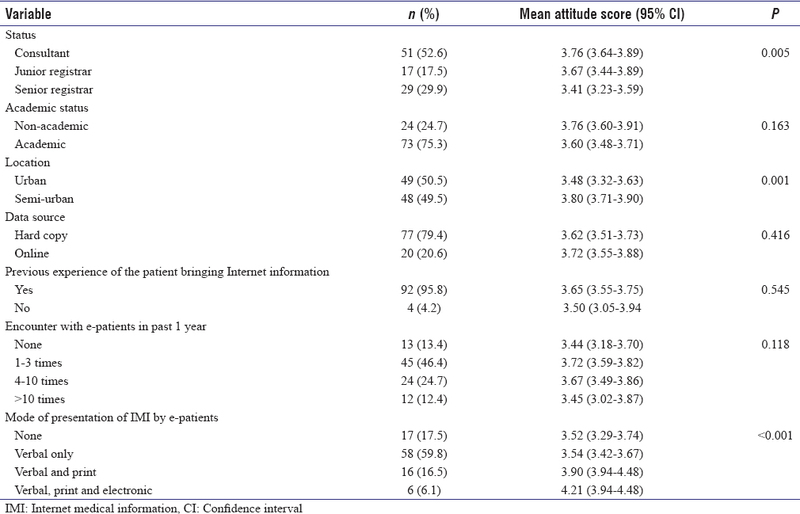 Attitudes towards patients presenting Internet medical information (IMI) is a 12-item questionnaire based on a similar instrument developed and used by Giveon et al. among Israeli primary care physicians. We asked participants to indicate their agreement with each statement on a 5-point Likert scale (from 1 = strongly disagree to 5 = strongly agree). The score was the average of all the items. A high score indicated a positive attitude. Professional Internet Use Frequency Index (PIUFI) is a 7-item questionnaire with which we sought to assess the physician's usage of common Internet activities. We asked the participants to indicate the frequency of performing each operation on a 5-point Likert scale (from 1 = never to 5 = very often). A high mean score indicated frequent Internet usage. Internet self-efficacy is a 2-item questionnaire with which we sought to assess physicians' ability to use the Internet. Respondents scored each item on a 7-point Likert scale (from 1 = not at all to 7 = to a great extent). A high score indicated ease of usage. Internet use apprehensiveness is a 2-item questionnaire with which we sought to assess physician's anxiety about using the Internet. Respondents also scored each item on a 7-point Likert scale (from 1 = not at all to 7 = to a great extent). A high mean score indicated a high level of apprehensiveness. It is a 5-item questionnaire of the Yes/No type. The items in this section were designed to assess the physicians' previous experience with Internet use as well as their previous experience with patients bringing IMI to an appointment. The professional self-esteem is a 10-item questionnaire based on a similar questionnaire developed by Carmel for use among Israeli physicians. We asked participants to indicate their agreement with each statement on a 7-point Likert scale (from 1 = definitely do not agree to 7 = definitely agree). A high mean score indicates a high self-esteem. They were based on the questionnaire developed by Barnoy et al. for use among Israeli nurses. The questionnaires were modified for use among Nigerian physicians, for example, items referring to the Hebrew language were removed, and all instances of 'nursing profession' were changed to 'medical profession'. We carried out a pilot study among twenty orthopaedists and the items were further modified as a result of this. [Table 1] shows the result of the reliability analysis of the questionnaire and implies that the instruments we used can be relied on to detect what we set out to achieve. We analysed the data using IBM SPSS (IBM Corp., Armonk, NY, USA) Statistics version 21. Apart from descriptive statistics for univariate variables, we also generated the analysis of variance (ANOVA), correlations and multiple linear regression to assess the effect of various variables on the outcome variable (physicians' attitude). We fitted a multiple regression model to assess the effects of 13 variables on attitude. They were considered important based on the literature search. We used an enter selection method to fit the model using standard techniques for model checking. Based on the regression diagnostics, we removed age, years of practice and ICT experience due to high multicollinearity. Likewise, we excluded one of the cases (number 3) because it had a high standard residual (3.428) in case-wise diagnostics. The R2 was 0.531, meaning the model accounted for 53.1% of the variance in attitude, and the ANOVA for the model was <0.001 meaning the model fitted the data. One hundred and twelve questionnaires were collected through the three methods we used to collect the data. Seven were discarded due to errors in filling the forms leaving 105 forms (93.8%) for analysis. There were 101 males and just 4 females giving a male-to-female ratio of 25:1. Ninety-nine (94.3%) has had a previous encounter with patients bringing IMI to the consultation while just six (5.7%) had not. Of the 99 with a previous encounter with patient wielding IMI, 12 (12.1%) did not have such encounter within the past 1 year, 46 (46.4%) had it 1–3 times, 28 (28.2%) had it 4–10 times, while the remaining 13 (13.1%) had it more than 10 times. The most common form by which patients bring the information is verbal (57, 65.5%), followed by print (22, 25.3%) and finally on phones, tablets or laptops (8, 9.2%). The mean attitude score was 3.64 ± 0.46 [Table 2]. [Table 2] shows the basic demographic and professional characteristics of the respondents in terms of their attitude score. Consultants scored significantly higher than resident doctors (post hoc test actually showed that there was no significant difference between the mean score of junior and senior registrars). There were two unexpected findings in this table. One was the significantly higher scores of doctors in semi-urban towns compared to their counterparts in urban cities. The other was the insignificant difference in the mean attitudes of those with previous experience of patients bringing IMI to the consultation and those with no previous experience. Similarly, the frequency of physicians' encounters with patients within the past 1 year had no bearing on their attitude to patients wielding IMI. However, the nature of the encounter had an effect on the physicians' attitudes: those who had been presented with IMI in more than one form had more positive attitudes. We correlated the mean attitude score with the mean physician self-esteem (MPSE), the mean Professional Internet Self-Efficacy (MPIUFI), the mean apprehensiveness, the mean Internet use efficacy, age, years since graduation, years since the first contact with computer and years since becoming a consultant. Only the MPSE (0.605) and MPIUFI (0.530) were significantly correlated with physicians' attitude, which indicated that the higher a physician's self-esteem and the more effective the physician is at using the computer, the more positive his attitudes to patients with IMI. Using multivariate linear regression analysis, we looked at the predictive value of 10 variables [Table 3] on attitude. In this study, multiple regression showed that the significant predictors of physicians' attitude towards patients bearing IMI were PSE, PIUFI and the physician's experience of the way the IMI was presented by e-patients (verbal, print or on phone, tablet or laptop). The Internet has become a major source of health information for patients all over the world. While this trend is more profound in high-income countries (HICs), it is also rapidly increasing in low-middle income countries too. This fact is corroborated by the findings in this study where 94% of the surveyed physicians have had previous encounters with patients presenting with IMI at consultation and 13% had experienced it more than 10 times within the year of the study. This, together with the fact that such encounters came in different formats, including printed, verbal and electronic, suggests that such encounter can only become more frequent in the future, and physicians need to find ways to cope with the phenomenon. According to McMullan, there are three ways for a physician to respond to the e-patient: one, which is the usual recourse of the physician with poor IT skill, is for him to respond defensively by asserting his 'expert opinion,' which of course may serve to alienate the patient causing the patient to seek medical opinion and treatment elsewhere. The second option is for the physician to collaborate with the patient in integrating their information. Because patients have the time and the motivation to hunt for the necessary information on the Internet, they sometimes possess more information on their specific diseases than their physicians. Nevertheless, such patients still need the skill and knowledge of the physician to integrate the information they have acquired into beneficial treatment protocols. All the same, physicians may still complain about the time it will take to answer patients' questions as a result of IMI. The third option is what Gerber and Eiser referred to as 'Internet prescription' and it is the situation where the physician recommends websites to patients. The obvious advantage of this approach is that it ensures that patients get reliable and accurate medical information. The main problem with the approach is that for the information to be accurate, and up to date, physicians need to keep track of reliable sources of health information on the Internet, which means they themselves must be Internet savvy, and they must, of course, find time not only to ferret out the information but also to discuss it with the patient because even high-quality information can be misinterpreted and misunderstood by patients. At first look, the fact that doctors in urban cities with better Internet options including Wi-Fi hotspots and broadband had significantly lower mean attitude scores than those in semi-urban towns, where Internet access options were limited to cellular data seemed counterintuitive. The most likely explanation is that most orthopaedists living in the big cities ran heavier schedules compared to their counterparts in semi-urban centres, and they may find the extra time demand of e-patient burdensome. Giveon et al. in a study of Israeli general practitioners showed that physicians with heavy workloads resent the extra time and attention required by e-patients. One of our hypotheses was that physicians with previous encounters with e-patients would be more likely to have a more positive attitude than physicians without no such experience. However, the t-test result showed no significant difference between the two groups. As evidenced by the wide confidence interval of the statistics, the finding is probably due to the fact that there were only six physicians with no previous experience, and of these six, only four were included in the t-test (remaining two were excluded because their attitude score could not be computed as the data were incomplete). We also did not find any significant correlation between attitude towards e-patient and demographic variables such as age, gender, status as consultant/registrar, year of graduation as well as experience with ICT. The most important predictor of a more positive attitude towards e-patients was professional self-esteem. According to Carmel, professional self-esteem was defined as an individual's attitude about personal professional competence, performance and worth along a positive–negative dimension. It was assumed to be central to physicians' feelings of self-worth, it was expected not only to affect a physician's job performance but also his job satisfaction and life satisfaction. It had been suggested that health professionals needed to have a positive regard for themselves before they can value their patients. Therefore, physicians with high self-esteem were less likely to feel threatened by e-patients and may find it easier to manage the challenges of handling them. The other significant predictor was PIUFI, a measure of physicians' competence at handling basic Internet-related activities such as E-mailing, downloading and assessing online information. This indicated that the more competent physicians were at handling Internet-related activities, the more positive were their attitudes toward e-patients. Since it is expected that the number of e-patients will keep growing, it is important for physicians to improve their ability to retrieve information from the Internet. We have established that orthopaedic surgeons practising in Nigeria frequently encountered patients with IMI at consultations. Most of them had high positive attitudes towards these patients. Professional self-esteem was the single most important factor contributing to a positive attitude towards e-patients. Since PSE has been shown to change over time with training and experience which brings advancement and recognition, we advocate orthopaedic surgeons, and indeed, all physicians are trained to improve their competence in their field. In addition, they need to become skilled in online information handling. This will have the added benefit of improving their usage of evidence-based medicine, which is fast becoming the holy grail of medical practice. The major limitation of the study was that our sample of orthopaedist was not large enough to detect possible differences among subsets of orthopaedists in terms of demographic and professional variables. The authors would like to thank Professor Sara Carmel of the Centre for Multidisciplinary Research of the Ben-Gurion University for graciously providing us with the professional self-esteem questionnaire as well as a copy of the original published paper. We would also like to thank Miss Hauwa Adeniji for entering the data as well as the members of the Nigerian Orthopaedic Association who participated in this research. McMullan M. Patients using the internet to obtain health information: How this affects the patient-health professional relationship. Patient Educ Couns 2006;63:24-8. Giveon S, Yaphe J, Hekselman I, Mahamid S, Hermoni D. The e-patient: A survey of israeli primary care physicians' responses to patients' use of online information during the consultation. Isr Med Assoc J 2009;11:537-41. Akerkar SM, Bichile LS. Doctor patient relationship: Changing dynamics in the information age. J Postgrad Med 2004;50:120-2. Ahmad F, Hudak PL, Bercovitz K, Hollenberg E, Levinson W. Are physicians ready for patients with internet-based health information? J Med Internet Res 2006;8:e22. Potts HW, Wyatt JC. Survey of doctors' experience of patients using the internet. J Med Internet Res 2002;4:e5. Murray E, Lo B, Pollack L, Donelan K, Catania J, Lee K, et al. The impact of health information on the internet on health care and the physician-patient relationship: National U.S. Survey among 1.050 U.S. Physicians. J Med Internet Res 2003;5:e17. Carmel S. The professional self-esteem of physicians scale, structure, properties, and the relationship to work outcomes and life satisfaction. Psychol Rep 1997;80:591-602. Barnoy S, Volfin-Pruss D, Ehrenfeld M, Kushnir T. Factors affecting nurses' attitudes in israel toward patients who present them with internet medical information. Nurs Outlook 2008;56:314-21. Gerber BS, Eiser AR. The patient physician relationship in the internet age: Future prospects and the research agenda. J Med Internet Res 2001;3:E15. Cook SH. The self in self-awareness. J Adv Nurs 1999;29:1292-9. Hurwitz SR, Slawson DC. Should we be teaching information management instead of evidence-based medicine? Clin Orthop Relat Res 2010;468:2633-9.